It’s a question that has often occurred to me when I’ve visited art galleries around the country; “What have they got hidden away in the basement?” And it has also struck me that, in these days of austerity, when local galleries have been badly affected by cutbacks, there is a particularly strong case for them using what they’ve got rather than going to the expense of bringing in paintings and other works of art from outside. In an ideal world it would be pleasant to think that there would be sufficient funding to mount exhibitions that did feature borrowed works. We don’t live in an ideal world. It’s interesting to see that Touchstones, Rochdale’s art gallery, has risen to the challenge of digging out at least some of its collection. The current exhibition showcases over 200 items, which is approximately 13% of their holdings. It may be thought that, when deciding to select material, the normal procedures would apply, i.e. the curators would choose what they considered the best in terms of the quality and lasting value of a painting. Instead, it was decided that the intention would be to provide a broad focus by working from the list of ”accession numbers, the order in which works have entered the collection”. The result is a fascinating selection, ranging from the ordinary to the good, with a few paintings that would be noteworthy in any context. The point of the exhibition is not to highlight the excellent, and it’s very much left up to the viewer to decide what he or she finds most attractive or provocative. I doubt that one visit is sufficient to make a fair appraisal of many of the works. In order to maximise the number that could be shown they’re hung in a way that sometimes requires good eyesight and an ability to look upwards without strain in order to pick out some of the smaller paintings. A printed wall plan is available, so names and titles can be identified when they’re not obvious on the work itself. There were times when I wanted to get closer to a painting but found it impossible because of where it was placed. Leaving aside questions of how the material is displayed, the exhibition is a great opportunity for a series of useful discoveries. Obviously, individual interests and preferences will determine what is picked out for comment. 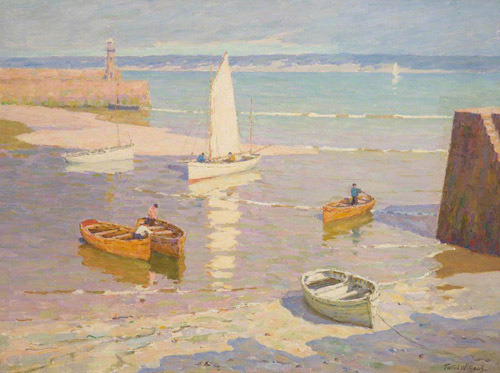 I noticed a particularly fine Terrick Williams painting of the harbour at St Ives, and I was pleased to see that there are a couple of small works by Edgar Rowley Smart, a little-known Manchester artist whose “Quai St Michel” (Manchester City Art Gallery) I’ve always had a great fondness for. The two small works in Rochdale are also of Parisian scenes, Smart having lived in the city at one time. I have seen it said of him that he had a taste for the bohemian life, but he also suffered from tuberculosis and died in the 1930s at a relatively early age. A large Frank Brangwyn marine painting stands out, and I came across a somewhat disappointing Tristram Hillier canvas. Vanessa Bell, Augustus John, Mark Gertler, John Piper, Laura Knight, Harold Knight, are all names I recognised. But I know nothing about Daniel Stephen, whose “The Painter’s Studio” caught my attention. It bears out the point of an exhibition of this sort. It’s best to ignore names and just look at the paintings and decide how appealing or interesting they are. There’s no doubt that certain items by well-known artists are clearly minor works, which is perhaps why the gallery could afford to buy them, whereas some of the lesser-known painters produced occasional works of note. It makes one wonder what else Rochdale has in its holdings that we have yet to see. In the meantime the current exhibition is well worth visiting, and even more than once. And let’s hope that other local galleries do something similar.